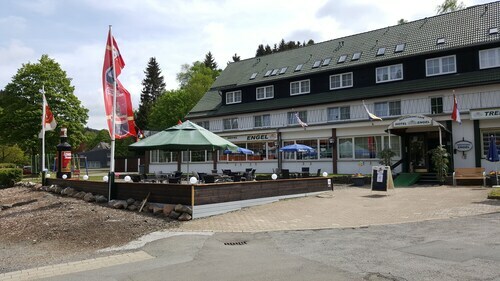 Located in Goslar Rural District, this hotel is 1.9 mi (3.1 km) from Harz National Park and within 9 mi (15 km) of Brocken and Burgberg Cable Car. Harz Golf Club and Wurmberg Gondola are also within 9 mi (15 km). Located in Goslar Rural District, this hotel is 3.5 mi (5.7 km) from Oker Dam and within 12 mi (20 km) of Brocken and Harz National Park. Burgberg Cable Car and Gustav Adolf Stave Church are also within 12 mi (20 km). Located in Goslar Rural District, this hotel is 4.4 mi (7 km) from Oker Dam and within 12 mi (20 km) of Brocken and Harz National Park. Gustav Adolf Stave Church and Burgberg Cable Car are also within 12 mi (20 km). Located in Goslar Rural District, this hotel is 3.5 mi (5.7 km) from Oker Dam and within 12 mi (20 km) of Brocken and Harz National Park. Gustav Adolf Stave Church and Burgberg Cable Car are also within 12 mi (20 km). How Much is a Hotel Room in Altenau? Hotels in Altenau start at $68 per night. Prices and availability subject to change. Additional terms may apply. Are you planning to have time in Harz? Need to reserve accommodation in the Altenau area? Travelocity's extensive hotel guide currently is showing 4 accommodation options within a 6-mile (10-kilometer) distance of Altenau. There are just a small number of accommodation options located within easy walking distance from the downtown precinct of Altenau. 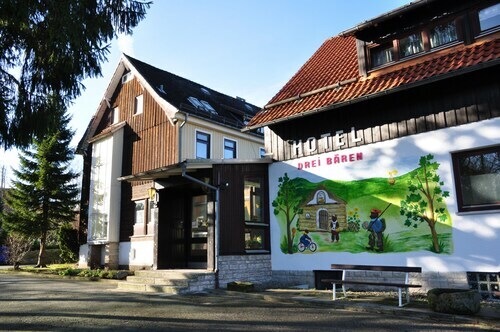 The Hotel & Hostel Drei Bären is a good choice for the fact that it's only 2 miles (3 kilometers) away. The Landhaus Zu den Rothen Forellen is positioned 10 miles (17 kilometers) outside of the main part of Altenau. Another option is the Maritim Berghotel Braunlage, which is located 8 miles (13 kilometers) away. The Braunschweiger Hof and the Hotel Riemann are alternative bases in Altenau. When you've got the time, adventurous travelers should travel to other parts of the Saxony-Anhalt region. Discover Saxony-Anhalt's castles and old towns or relish the area's forests, rivers, streams and lakes. In this region of Germany adventurous visitors can partake in snowboarding, skiing and cross-country skiing. Looking for activities? Spend some time enjoying Goslar Imperial Palace and Mines of Rammelsberg, which you'll find in Goslar, 8 miles (12 kilometers) north of Altenau. The Altstadt Hotel Gosequell and RAMADA Hotel Baeren Goslar are a handful of the Travelocity lodging options in Goslar. 12 miles (20 kilometers) to the southeast of Altenau, is Sorge, which boasts the Hotel Tannenpark and Landhausferienwohnungen Am Brockenblick. While in Sorge, make sure you visit the Grenzlandschaft and Museum Sorge and Ring der Erinnerung. Just because you and your family are on vacation, should not have to mean that you shouldn't expand your obsession for a day watching sports. HDI Arena is situated 50 miles (80 kilometers) to the northwest of Altenau. Book accommodation nearby to the sporting action at the Cityhotel Königsstraße or the Sheraton Hanover Pelikan Hotel. Hannover Airport is a practical arrival point for air travel, and is found 55 miles (90 kilometers) away from central Altenau. Conveniently located hotels are Leonardo Hotel Hannover Airport and Maritim Airport Hotel.